In sports there is something known as the East Coast Bias. This means that oftentimes for awards and the like that teams and athletes that reside on the East Coast are more likely to win. The thinking behind this is that people on the East Coast are asleep by the time the teams and games on the West Coast are getting under way. Here at Benchmark Email there is no timezone bias. Formerly, this feature existed only in your Account settings. But say you’re sending to a segment of your list overseas. 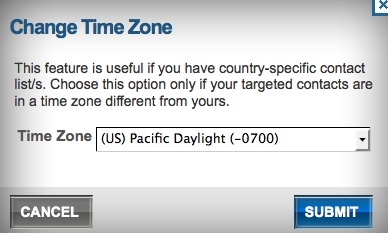 Rather than doing the calculations to make sure you’re not sending campaigns to a nation of sleeping people, you can choose the proper time in the timezone you want to send to. This is done in Step 5 (Schedule) of the email creation process. 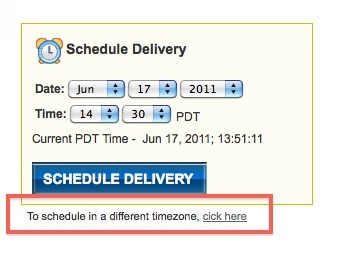 Directly beneath the Schedule Delivery box is a prompt that reads “To schedule in a different timezone, click here.” Clicking there will open a box that allows you to pick which timezone you would like to send to. Hit submit and your emails will now be delivered at an appropriate time when they are likely to be read.